If you are trying to rank your site online and improve the Internet marketing strategy of your business, then you should use every tool at your disposal. Since Google and other search engines put a lot of weight on the link, you can quickly boost the strength of your site with strong internal linking throughout your site. An internal link is any link that goes from one page on your site to another page on your site. Most often, these links come from text-based links in your content, but they can also come from navigation links on your main nav menu. Internal links provide your website the unique opportunity to improve the usability of your site and improve the online presence and SEO strategy. Before we look at how to improve your site’s internal linking structure, let’s take a look at the top benefits you will enjoy as you develop the internal linking of your site. Search Engine Optimization: Internal links pass authority from one page to another. Usability: Connected pages allow your audience to pass from relevant pages to other related pages. Conversion Rate Optimization: Interlinking your content can prompt visitors to convert of different pages depending on how you link your content. Behavior Metrics: Since your links point throughout your site, your audience is likely to click on the links. This will reduce your Bounce Rate, Pages per Session, and Time on Site. These metrics can improve your SEO stats and help rank your site in the long run. The first thing to think about when looking at how to improve your linking strategy is to consider the power of your website starts with how relevant your content is for your audience. The only way to improve the Page Authority of your pages and Domain Authority across your site is to create content that your customers are looking for. You should always be looking for ways to understand the needs of your customers and then develop great content to answer their questions and address their needs. One way that you can use relevant content on your website is to generate great information on your blog. Your blog is an excellent source to share engage with your customers and establish yourself as a thought leader. You can do this by producing amazing blog content and website content for your site that gets found by Google and engages your customers. This will boost your sales and help you improve your online presence. At the same time, since Google loves fresh content, your blog content will likely be picked up in SERPs for specific search queries. As a result, your blog content can link to your internal pages to boost traffic and power of your internal pages. If you are looking to raise the presence of a new page or service on your site, linking within your site to the target pages is one of the easiest ways to increase the power of your desired page. In the previous point, we discussed that blog posts get found by Google and how we can improve internal linking by pointing links from blog posts to internal links. If you have an extensive content library on your site that you have already developed, then you want to make sure that your existing content is linking to your internal content correctly. In the case of StrategyBeam, we have a vast content library, and I want to drive more authority and traffic to my money pages, so we will take a look at how to do this with some examples. To do this we can log into Google Analytics, and go to Behavior > Site Content > All Pages. 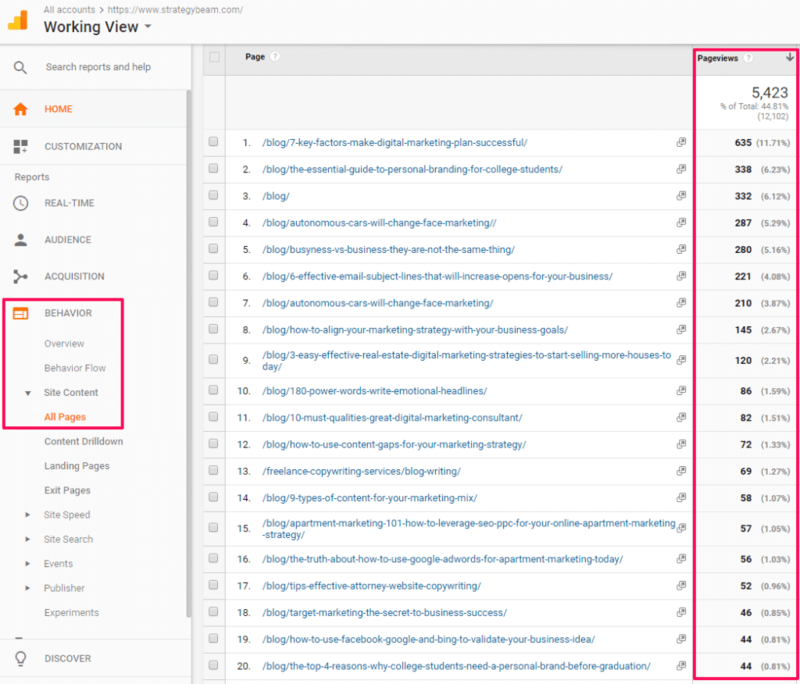 From this, we can see a list of the posts by page views, and we can start with the top 20 blog posts over the past 2 months to start with and then optimize that content with improving internal links. Now that we have a list of our most popular posts, we should either export or note these posts so we can track our progress. The next step to optimize our site with internal linking is to use exact-match links to drive Page Authority and traffic to the pages that will help drive our business goals. This is the first step to understand opportunities to improve our SEO strategy with internal linking, and help us rank higher in search engines. Use anchor text that are keywords for the page that you are linking to. Use unique keywords throughout your site as you connect different pages. Use keyword-rich anchor text links above the fold when possible. Don’t use generic anchor text like “Click Here” since it is a wasted opportunity to build your Page Authority. Don’t use too many links in your Footer or other static locations. Don’t use irrelevant anchor text when linking to posts and/or pages. This will confuse Google and reduce the Page Authority for connecting pages. The best practice for building content that gets found by Google is to identify unique keywords for each page on your site. Once you have these keywords defined, the process to optimize the internal link strategy of your site become much easier. The next step to improve internal linking on your site is to work on the top ranking blog posts that we identified in the previous step. In each position, we should find text that we can link to our money pages with exact-match anchor text. For our example, I wanted to add internal links throughout my site to the 160+ Free Marketing Tools For Small Business because I am trying to rank this page and build the Page Authority. We can do this same process for the remaining posts on our site and drive more exact-match links to the desired page. This process can take some time, but reviewing our blog posts in this manner is another way to check spelling errors, and optimize other elements of our content at the same time. The Google algorithm is always improving to learn more about your site, but it is your responsibility to organize your content in tight structures to help Google understand your site. Think about it- Google relies on bots to crawl your site to understand the structure, determine what is relevant, and relay this information back to it’s army of servers. This is not an easy task, so you can help Google understand your content and crawl your site more efficiently if you organize your content in a logical manner. Plus, organizing your content in tight groups also helps your audience navigate your site. This means that organization of content on your site not only impacts your ranking on Google, it also has a direct effect on the usability of your site by human readers. Building links for other websites can help boost your online presence, and developing a strong internal link structure can also help your site improve in ranks and drive more conversions! These silos are crucial to help your audience understand your content, and it is also important to maintain Google rank your site. Part of aligning your content into content silos means that you need to follow a tight path of only linking between content in each sailor. Below is a diagram showing how internal linking should occur between your content silos. As you can see, we keep our Parent Pages and Child Pages together since they have similar content and they are related to each other. 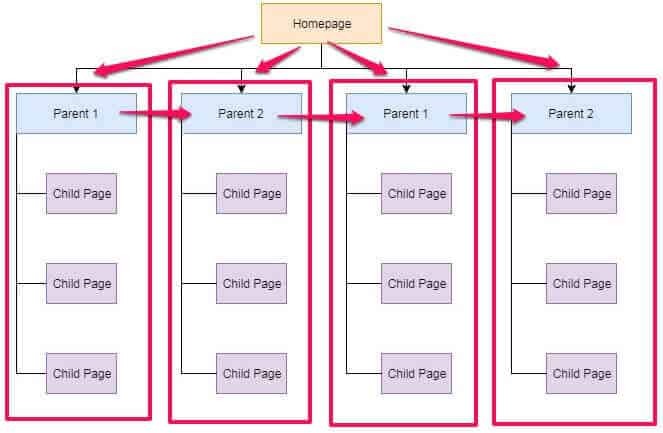 Parent Pages should link to their respective Child Pages, and each Child Page should relate to other Child Pages in the same silo and their Parent Page. 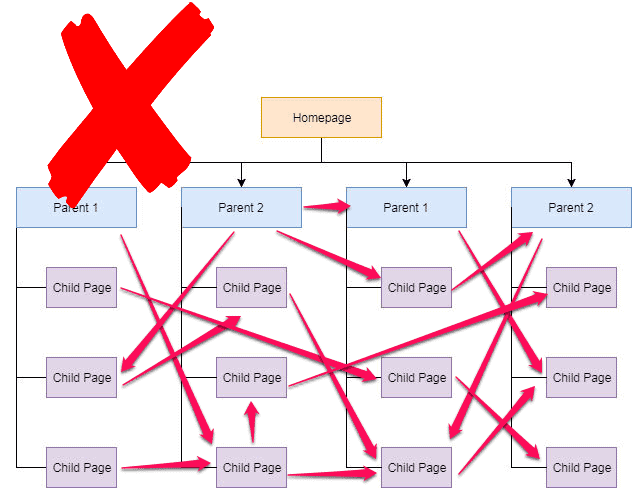 However, Child Pages in one silo should not link to Parent or Child Pages in other content silos. The only cross-content silo linking should come from Parent Pages that link to other Parent Pages. Below is an example of how you do not want your internal link structure to look. As you can see, this is a very confusing diagram to look at and it is also as confusing for Google to understand as their bots crawl your site. By following the basic rules of internal link structure you will be able to improve the usability and drive a stronger SEO strategy for your site. This may sound complicated, but as you build out your content and interlink your content silos, it is beneficial to follow a strong linking strategy. This will help Google understand that all content in one content silo is related to each other and the algorithms will drive traffic and Page Authority through Parent Pages in each silo to their respective Child Pages. Don’t wait to take action today to drive your online presence with internal links. These are free, easy, and efficient to help you improve usability across your site and rank your site in Google. 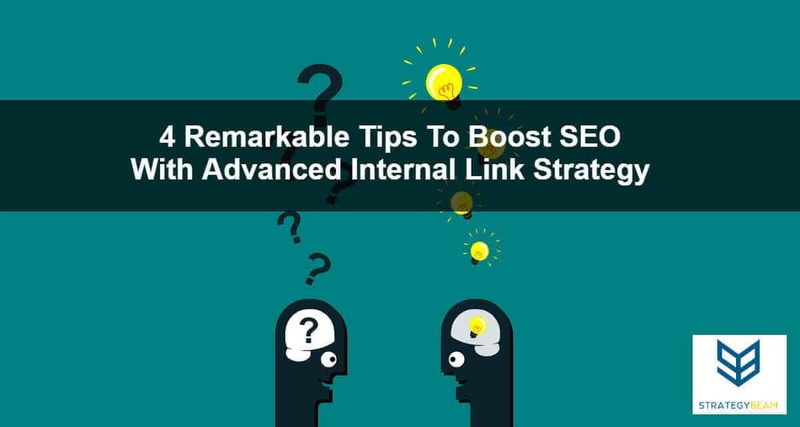 Follow the above tips to identify opportunities to improve your On-Page SEO strategy with internal links today!